Here's a short post on visualizations and distortions, unintentional but still there. 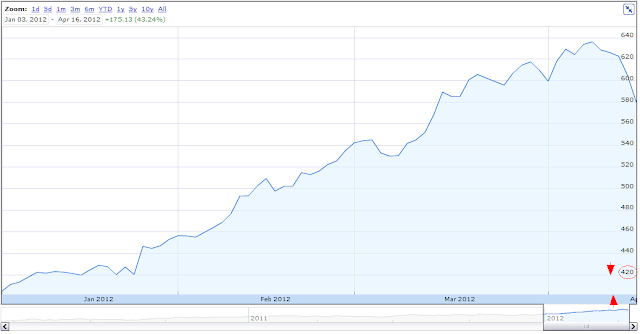 There was an article on the web that remarked on the rather steep fall-off in Apple's stock over the past week or so. I went over to Google Finance to take a look. What I found was interesting. I took some screenshots and have added them to this blog post. I wanted to find out how much the stock had actually fallen, which is easily done, and how much the line chart was portraying as the fall in the stock, also fairly easily done. Let us do some math now. Simple math, the kind I like, the only kind I can probably do now. First, let us calculate how much the stock has actually fallen. 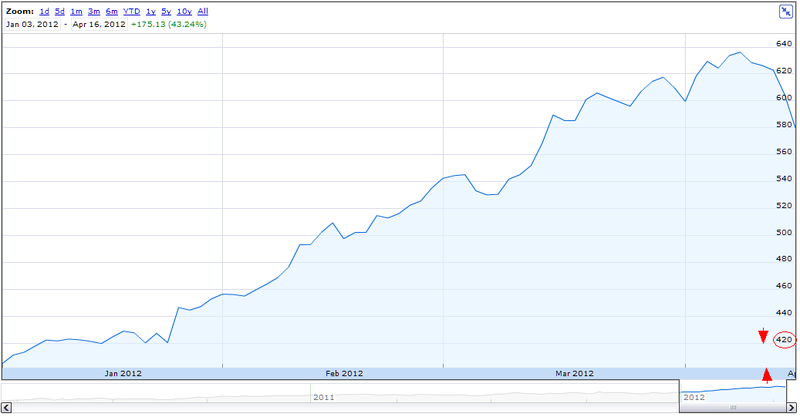 The Google Finance page on Apple, http://www.google.com/finance?q=aapl , tells us that on April 16, the stock closed at $580.13 - which we will round off to $580. Next, we find that its 52-week trading high was $644. So, you can see that the stock has fallen $64 from its peak, which translates into a 10.2% fall from its peak (64/640). So, the first number of significance is 10.2% - we will format it bold to make it noticeable. Next, take a look at the first chart. Even with a linear scale, the problem is that the axis does NOT begin from zero. Notice the first number on the vertical axis is $420 - Google is using a broken axis, which is useful for highlighting the magnitude of changes, as in this graph, but misleading because of its very nature; it inaccurately magnifies increases and decreases. By how much? Let's calculate. If you were to take a measure and see what is the height of the stock chart from the base to its maximum, i.e. $644, you would find it measures 4" from top to bottom - approximately. Next, you measure the fall from the peak of $644 to the current trough of $580. It measures approximately 0.95". So, in this chart, a peak of $644 equates to 4". A drop of $64 measures 0.95"
Therefore, the chart plots the drop as a 23.75% drop as seen on the chart - we will bold it to make it noticeable. There you have it - an actual drop of 10.2% looks, note, looks, like a 23.75% drop. To put that in perspective, had the stock actually fallen by 23.75%, it would have sunk by $152. Yes, and it would have been trading at $492. Even when you change the time-scale to 5 years, it does not help completely, because the vertical axis is STILL a broken axis. The inaccuracy as displayed on the chart is a lot less, but it is still there. It is only the 10-year plot that has a true, non-distorted picture of the stock. But because of the 10-year plot, the recent rise and steep 10% fall is not very visible. If you zoom only into the current year, 2012, then the distortions creep right back into the graph. What Google Finance needs to do is add an option, a checkbox, in their Settings panel to allow a user to select whether they want an unbroken axis or not - i.e., to let the charting engine plot a broken axis when it sees fit, or to always display an unbroken axis.